Vocal nodules (also known as vocal fold nodules or vocal cord nodules) can develop if you use your voice too much over a long period of time. They make your voice hoarse and change the sound of your voice. These small, benign (non-cancerous) nodules usually go away again if you rest your voice or do voice therapy. Surgery is only very rarely needed. The vocal cords are two folds of membrane tissue roughly in the middle of the larynx. 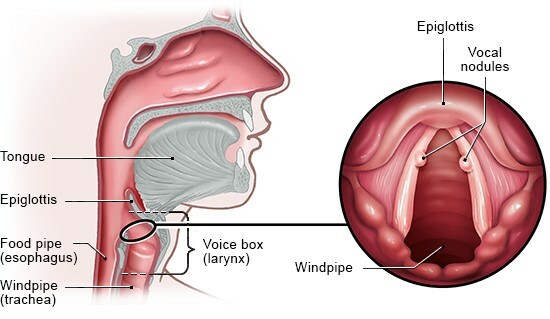 Also known as the voice box, this is the part of the throat where air enters the windpipe. The outer edges of the vocal cords are attached to muscle tissue that helps to change their position: When you speak or sing, your vocal cords move closer together. As air passes through them, they vibrate and make sounds. If the vocal cords are overused, the membrane tissue becomes swollen and small nodules may develop. Problems with your voice can also be caused by other things. The most common cause is an inflammation of the larynx (laryngitis). Smoking and vocal cord paralysis can also lead to problems with your voice. In rare cases, they are caused by a malignant tumor (cancer) or psychological problems. Vocal nodules typically make your voice hoarse, and it may sound raspy or breathy too. People who have vocal nodules also can’t hold a note for as long as they used to. And they can no longer sing very high or low notes, or speak in a very high or deep voice. Using your voice too much can cause swelling in the membranes lining the vocal cords and the tissue beneath that. The vocal cords then no longer fit together properly, causing irregular vibrations that change the sound of your voice. This makes it harder to make sounds; your voice becomes hoarse or you lose your voice completely. Things like talking too much or too loudly can lead to overuse of your voice. For instance, people who are hard of hearing tend to talk very loudly. Some people unknowingly always use too much force when talking. This puts a lot of strain on the vocal cords too. It may happen because they are very anxious or always breathe into their chest rather than into their belly. A bad posture can also make voice problems more likely. The risk of vocal nodules is higher in people whose work involves using their voice a lot. Professional singers are an example. Using the wrong singing technique can also increase the risk. For this reason, vocal nodules are sometimes also called singer’s nodules. Teachers are more likely to have them too. Not only do they have to talk a lot, they often have to raise their voices to be heard. Working in a call center, a kindergarten or daycare center can also wear out your voice. Babies and toddlers who cry or scream a lot might overuse their vocal cords, leading to nodules. Vocal nodules are most likely to develop in women and children. They are among the most common causes of hoarseness in children. If you overuse your voice, both vocal cords becomes swollen along the edges at first – particularly between the front and middle third. These are the parts of the vocal cords that are used the most. People will already start having problems with their voice at this point. If they continue to overuse their voice, nodules develop in the swollen edges of the vocal cords. The nodules are about the size of a pinhead and are located opposite each other. Vocal nodules don’t usually cause any serious problems. If they don’t go away, though, they can keep causing problems whenever the person uses their voice a lot. To find out whether the problems are being caused by vocal nodules, the vocal cords need to be examined by a specialized doctor, such as an ENT (ear, nose and throat) doctor. This examination, known as laryngoscopy, is done using a flexible or rigid tube-like instrument called an endoscope (or laryngoscope). The mucous membranes are sometimes numbed using a local anesthetic. Doctors can also measure how easily the vocal cords vibrate using a special device that magnifies the vocal cords. Known as a stroboscope, this device has a light on it that flashes very quickly. The flashing light makes the vocal cords appear to move in slow motion, making it possible to take a closer look at them. It is important to rest your voice enough, particularly if you speak or sing a lot. This can help to prevent vocal nodules. If your voice tends to tire easily or become hoarse, voice therapy may help to prevent long-term voice problems. This type of therapy involves learning to be more aware of your posture and breathing, as well as voice and breathing exercises to make your voice stronger and more resilient. The main thing to do is rest your voice as much as possible. For instance, people who talk on the phone a lot might be able to communicate using written messages on their phone or computer instead. Parents whose children scream a lot can talk to their pediatrician to try to find out what they can do about it. As well as resting their voice, older children and adults can have voice therapy too – for instance, with a speech therapist. This involves learning to coordinate your speech and breathing, relaxing and improving your posture. Sometimes people are advised to moisten the membranes lining their larynx (voice box) using steam inhalations, or they may be prescribed transcutaneous electrical nerve stimulation (TENS). Medication is hardly used in the treatment of vocal nodules. If they don’t go away after resting your voice and trying out the above treatments, you may be offered minor surgery to remove them. This procedure is associated with the same risks as all operations that are carried out using an anesthetic. In rare cases it can lead to scarring that changes the sound of your voice in the long term. Vocal nodules can be a problem if you have to talk a lot or often have to talk loudly at work. If you keep having voice problems, it’s important to think about how you can rest your voice. For instance, tasks at work that involve using your voice a lot could perhaps be carried out by colleagues instead. If you have to raise your voice due to loud background noise, you could ask your employer to provide you with a quieter environment or a microphone. With the help of measures like these and voice therapy, voice problems can often be kept under control. But it is still better to take voice problems seriously in order to avoid having to take a lot of sick leave, or even having to change your profession. Mansuri B, Tohidast SA, Soltaninejad N, Kamali M, Ghelichi L, Azimi H. Nonmedical Treatments of Vocal Fold Nodules: A Systematic Review. J Voice 2018; 32(5): 609-620. Martins RH, Pereira ER, Hidalgo CB, Tavares EL. Voice disorders in teachers. A review. J Voice 2014; 28(6): 716-724. Reiter R, Hoffmann TK, Pickhard A, Brosch S. Heiserkeit – Ursachen und Therapie [Hoarseness - causes and treatments]. Dtsch Arztebl Int 2015; 112(19): 329-337. Roy N, Barkmeier-Kraemer J, Eadie T, Sivasankar MP, Mehta D, Paul D et al. Evidence-based clinical voice assessment: a systematic review. Am J Speech Lang Pathol 2013; 22(2): 212-226.